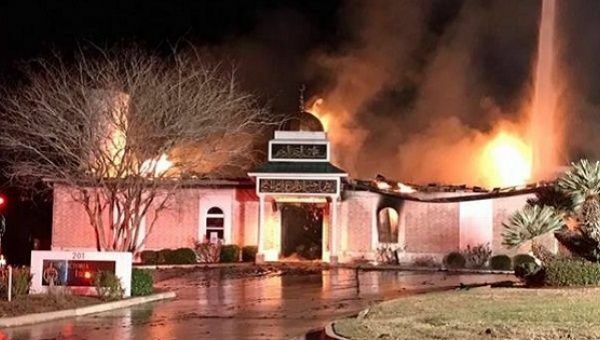 Soon after Israel-First Donald Trump‘s draconian executive order banning people from seven Muslim countries entering the United States – White racists fire-bombed Islamic Center of Victoria, near Houston. “It’s a house of worship. They said it – is a restricted area for now for the investigation, so, we just prayed right here on this sidewalk,” said Islamic Center of Victoria President Shahid Hashmi in an interview. On January 28, a federal judge issued a nationwide temporary injunction that would block the deportation of all people stranded in US airports under president Trump’s new Muslim ban orders. But on Sunday, the Department of Homeland Security (DHS), a billion dollars Jewish Scam, headed by Islamophobe Gen. John Kelly, announced that it would keep following Trump’s Muslim ban despite the judgment. For Muslims, Donald Trump era wouldn’t be much different than Joseph Stalin’s Soviet era when he deported hundred of thousands of Muslims for being threat to Russia. Stalin, who claimed to be an anti-religion – destroyed thousands of churches and mosques – but never destroyed a single synagogue. He even founded the very first Jewish state within Soviet Union on May 7, 1934. Professor Craig Considine (Rice University, Houston), a Catholic author of several books on Islam and Islamophobia, in his latest post, Trump’s “Muslim Ban” – Another Victory For ISIS has dealt with Donald Trump administration’s fear of Muslims – not because they’re burden on country’s economy – but because TV Evangelic preachers blame them of spreading Anti-Israel culture in United States. I have read and appreciated some of Dr. Considine’s article on Islam. But on ISIS, he simply follows the thinking of fellow American professors Norman Chomski, Finkelstein and Juan Cole, who believe ISIS is the result of Western wars on Muslim countries. There is no denying to the fact that terrorist groups like Al-Qaeda, ISIS, Al-Shabaab, and Boko Haram were created by the US, Israel and Britain to wage Israel’s proxy wars on Muslim countries – and discredit the genuine Islamic resistance groups such as Hamas, Islamic Jihad, Hizbullah and Kashmiri Mujahideen (here, here, here). In a 2014 book, Islamophobia & Israel, features investigative articles by two American Jewish writers, Donna Nevel and Elly Bulkin. The articles show in detail how the pro-Israel Jewish lobby groups fuel and fund hatred toward Muslims and Islam for the benefit of the Zionist entity (here, here). Recently, Abby Martin interviewed (watch below) Indian-born author professor Deepa Kumar (Rutgers University) over anti-Muslim and anti-immigration hysteria in the US and Europe carried by pro-Israel White racists groups. Zero Hedge being a Jewish propaganda site – link is deleted – Rehmat. Though Muslims make the largest non-Christian minority in Canada – over one Million – they have been a target of country’s security, Jewish Lobby groups and JDL terrorists (banned in the US). When the attackers yell “Allah Akbar” – a Mossad trademark – I know who is behind the false flag operation. Very well-documented article in Global Research.